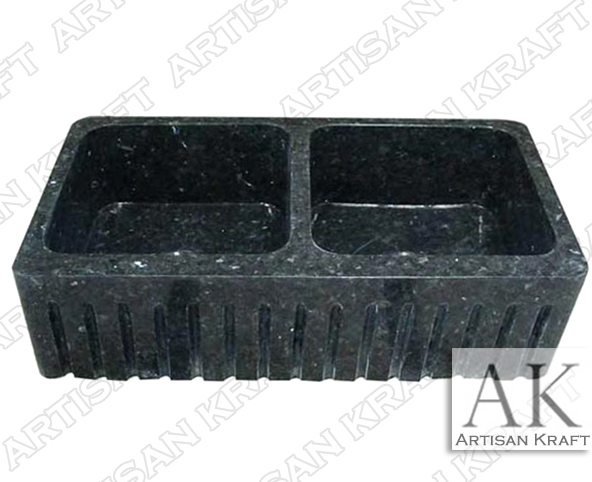 Black marble farmhouse sink carved from a solid piece of real black marble. The flutes on the front give it a sleek design. It can be made without the flutes. This is a contemporary design that is fitting for a traditional home. A large two bowl kitchen sink. It can also be referred to as a double basin or a double well. All these terms describe the same thing. A very simple design on this black marble sink with double basins. This can be made from other marbles as well. Here is a link to our marble vanity sinks. These are great for a web bar or a side table sink. Farmhouse sink carved from black marble. Order any product in custom sizes. Please give us a call or email for pricing.